Situated along the Caribbean coastline, Cartagena is a lively port town and one of the best tourist destinations in all of Colombia. 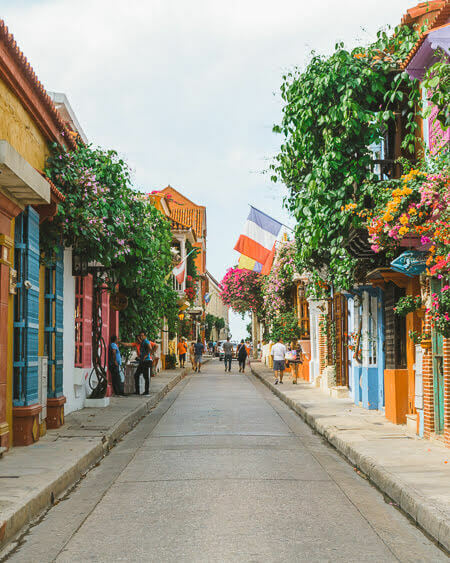 Cartagena’s colorful colonial downtown mixed with warm, tropical weather make it a much-desired vacation spot for local and international tourists alike. 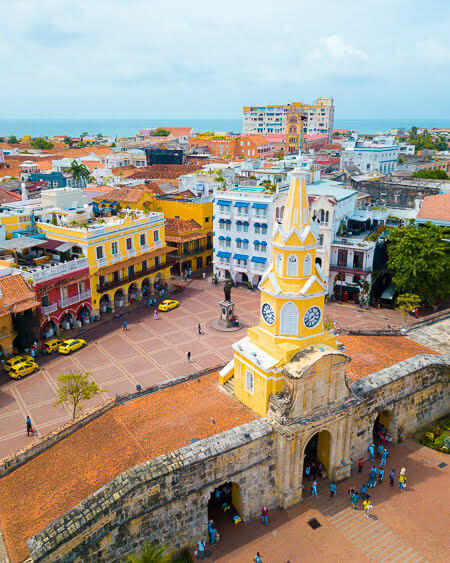 Although Cartagena is quite small compared to its bigger sister cities Bogota and Medellin, Cartagena is packed with amazing cultural experiences and endless things to see and do. 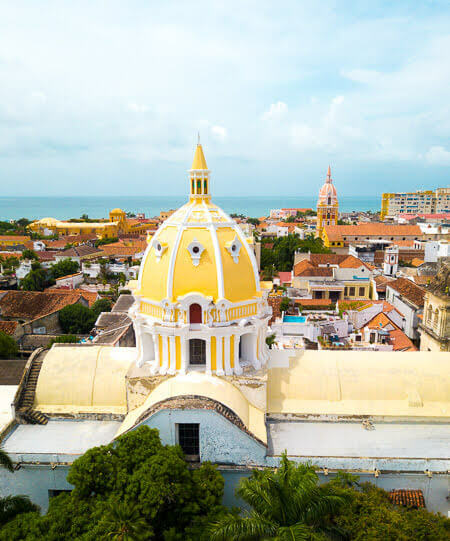 Whether you are traveling to Cartagena to enjoy a few relaxing days on the beach, to stroll around its cute colonial downtown or dive into the fun nightlife, there is so much to love about Cartagena. One of my favorite ways to explore a new city and really soak in the environment is by walking around. Cartagena’s Old Town, also known as the Walled City, is the best place to experience the essence of Cartagena’s history and culture by foot. Walking around the Walled City you’ll feel history and mix of different influences around every corner. From neon colored buildings to ruins remaining from the defense walls surrounding Cartagena, its charm is undeniable. Founded in 1533 by Spaniard explorers in search of gold, emerald, and salt, Cartagena is reaching its 500 years of existence. Cartagena’s location and access to the ocean have made it a highly coveted and sought-after city since its inception. Cartagena’s history includes countless attacks and takeovers ranging from Pirates of the Caribbean to European countries. To defend itself from the attacks, Cartagena built huge walls around it that earned its nickname as the Walled City. Now the Walled City is the heart and epicenter of Cartagena’s history and culture. Unlike some of the bigger cities in Colombia, I felt perfectly safe exploring the Old Town area in Cartagena by myself. Although there are some areas especially east of Cartagena that I would avoid, overall security was not a major concern in old town Cartagena and I never got the sense of hustle and chaos that I felt in Bogota and Medellin. In a place that celebrates noise and color, I just loved strolling the streets of the historical center in Cartagena. You’ll see guys dropping rap beats on the street, ladies dressed in colorful outfits, street vendors yelling fruit names you’ve never heard of but yet somehow it doesn’t feel stressful or chaotic. 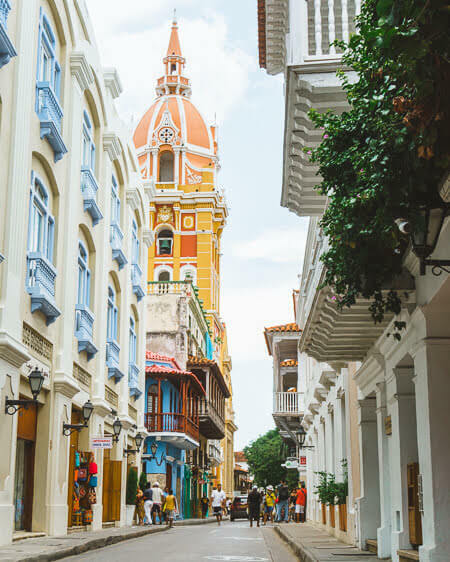 Although the Walled City is small enough that you can walk it in a few hours, there is still so much to explore around Cartagena that you could spend a week here and find new cool things to do. If you want to do an organized walking tour instead of roaming around solo, there is a cool free walking tour offered in Cartagena every Monday to Saturday at 9:30 am and 4:30 pm. To get more info on the tour, check out the Free Cartagena Walking Tour website here. Visiting the Tutomo Mud Volcano was one of my favorite things to do in Cartagena because you can’t experience something like this anywhere else. Totumo is a cone-shaped volcano but instead of spewing hot lava at the top the volcano is full of mud. The locals in the area have turned the Tutomo Volcano into a major attraction offering mud baths in the middle of it. But this mud bath is unique because anyone getting into the mud can’t sink. It’s almost gravity-defying letting visitors float top, similar to the Dead Sea. Getting into the mud bath is a bit tricky because the mud is so thick that it prevents you from moving around quickly. At first, it feels really strange because you can float on top of the mud without moving a muscle. As you make your way around the mud bath you can’t feel the bottom and while your mind is telling you that you should sink to the bottom, instead you are just suspended on top. The Totumo mud volcano is an hour drive from Cartagena and totally worth the drive to experience this strange and unique mud bath. It’s a popular tourist destination for Cartagena’s visitors so head there super early or late in the afternoon to avoid the crowds. The entrance to the Totumo Mud Volcano costs 10,000 Columbian pesos (around $3 USD) per person. I ended up paying 10,000 pesos for showers after the mud bath (very much needed) and tipping 4,000 pesos to some of the locals for helping me carry my clothes and camera gear after I got all muddy. 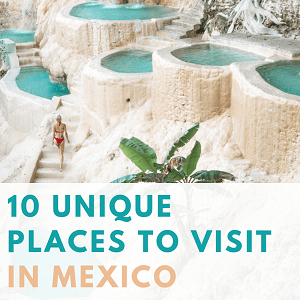 I personally didn’t visit Isla Baru but my friends Jimena and Kyle spent a few weeks there and had a lot of amazing recommendations for this beautiful tropical island. 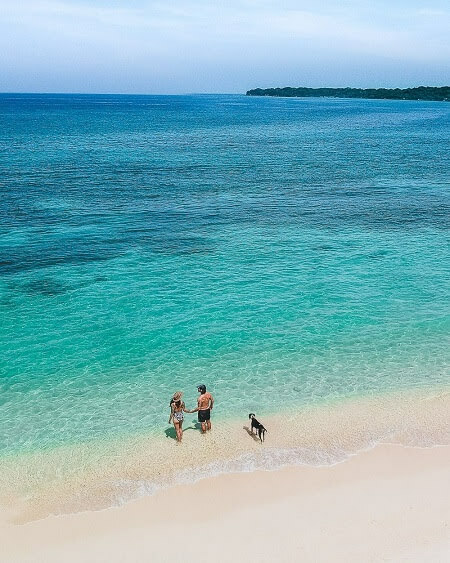 If you’re looking to get away from the hustle and bustle of Cartagena and white sand beaches are your thing, Isla Barú is the place to be. Crystal blue waters of the Caribbean Sea and the lush tropical backdrop of palm trees make this a Colombian paradise. With fast boats leaving the Port of Cartagena multiple times a day, the island can be easily visited as a day trip, making it perfect for a quick getaway. The short hour-long ride leaves you on the sandy beach of Playa Blanca. If you are looking to stay a few days, Isla Barú can be enjoyed on any kind of travelers budget. High-end luxury hotels, beach cabanas, to modern hip hostels, this island has it covered. The long stretch of Playa Blanca is filled with restaurants and bars, but make sure to bring cash – no ATMs here. 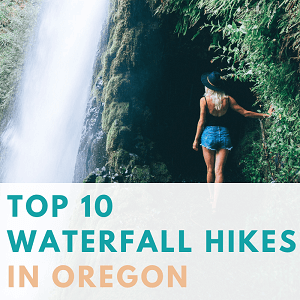 For the adventurous folks, you can easily rent jet skis, kayaks, and even ride a banana. Our biggest recommendation, find a lounge chair with your name on it, order a piña colada, and soak in the sun. 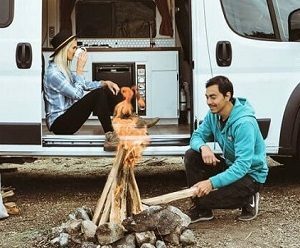 For more on Jimena’s and Kyle’s adventures check out their inspirational Instagram page @southbyvan. Monumento Torre Del Reloj, also known as the Puerta Del Reloj is the main entrance into the Old Town, Cartagena. If you’re exploring the historical area in Cartagena, this most likely will be your first stop. The Clock Tower Monument separates the Old Town peninsula from the rest of Cartagena. This monument is the perfect entrance leading Cartagena’s visitors away from new high-rises into a different era full of color and history. Situated right behind the clock tower is a lively plaza with street vendors, food carts, music, restaurants, and access to the rest of Old Town. At nights this area is also used for street performances and dancing. Plaza De La Aduana is one of the most beautiful city plazas I’ve ever seen. It’s a large, spacious plaza surrounded by colorful colonial buildings. The main attraction of the plaza is the statue of Christopher Columbus in the center of it. 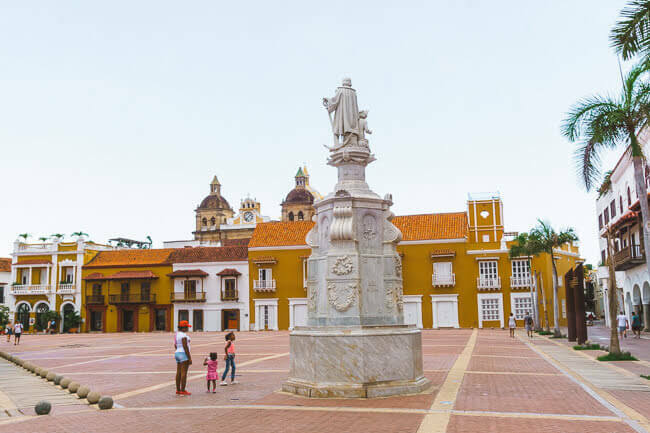 The plaza itself has a bit of dark history behind it because it was used as the main area for slave trading in Cartagena along with trading other imports and exports. As the largest plaza in Cartagena, it was also a place for offices and administrative buildings in the colonial times. Cathedral De Santa Catalina De Alexandria, or simply called Cathedral of Cartagena, is a majestic Spanish style church located in Cartagena’s old town. 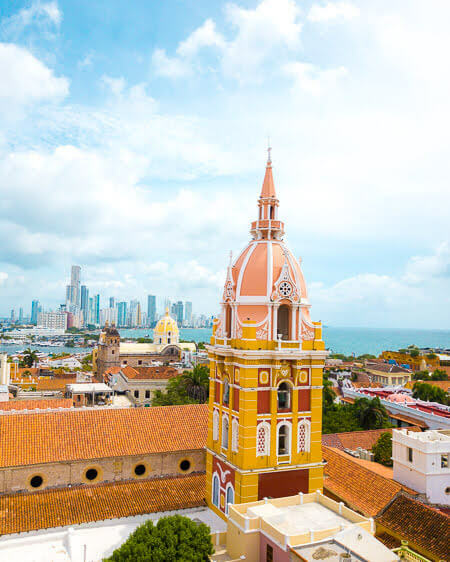 With impressive architecture and a pink & yellow tower soaring above the historical center in Cartagena this cathedral is both iconic and a must-see landmark. At night the tower is illuminated with lights and can easily be spotted from one of the cozy rooftop terraces and restaurants in Cartagena’s Old Town. Getsemani is a cute trendy area next to the historical center. This was my favorite area in Cartagena to people watch and relax at a cute café after roaming around Old Town. 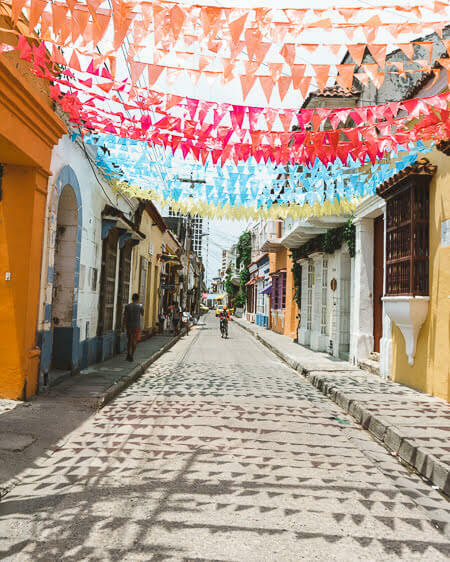 From the moment I entered Getsemani neighborhood, I could feel the streets come alive with music, dancing, and lively noise. It almost seemed like a scene from a movie with kids kicking a soccer ball around the main plaza, older guys sitting around playing chess and teenagers having a hip-hop dance-off in the background. Hotel Boutique Casa Isabel – top-rated boutique hotel in the Getsemani area. Hotel Capellan – beautiful luxury hotel with a rooftop pool and a bar. Selina Cartagena Hostel – most popular hostel in Getsemani. Street art is a huge part of Colombian street culture and it’s very prominent in Colombia’s bigger cities like Cartagena, Bogota, and Medellin. One of the most popular expressions of street art in Colombia is wall murals. These murals represent the rebirth of Colombia’s culture, a transformation from being known as a place controlled by crime and drugs turned into a place known for art and culture. Each wall mural tells its own story whether it’s a message of resistance, peace, love or fight against racism and mistreatment. 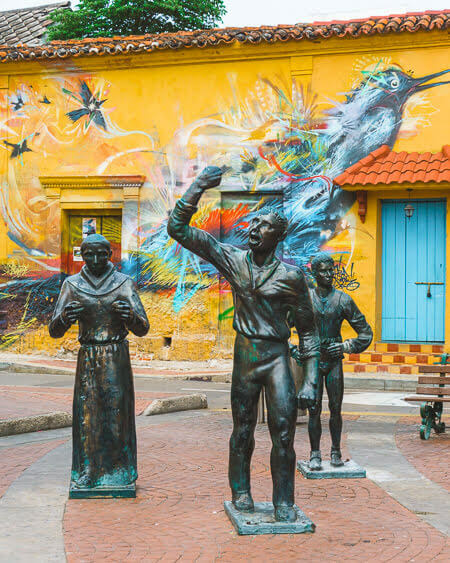 Along with wall murals, Cartagena also has a number of statues and cool tin figures scattered around Getsemani and Walled City representing Colombian people and everyday life for the locals. Most of Colombia’s art focuses around representing its people. In a culture that has been oppressed for such a long time, the locals have learned to speak through art. 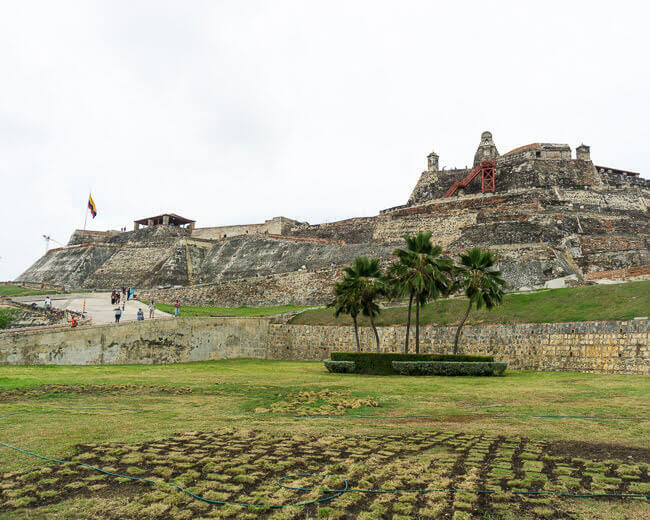 Castillo San Felipe De Barajas is an impressive fortress and a castle located on a hill in Cartagena that used to serve as a lookout for invaders through the land and sea. Built soon after the city of Cartagena was founded, this fortress is almost 500 years old. For 25,000 Colombian pesos (around $8 USD) visitors can enter this fortress and roam around its system of mazes, tunnels, and bunkers. Now, this castle and ruins are listed as a UNESCO World Heritage site and a major attraction for Cartagena tourists. One of the best parts about Cartagena was the amazing food that I found in Getsemani and Old Town areas. After spending 9 months traveling through Central America where the food flavors were pretty limited, I was beyond excited to find a variety of restaurant options in Cartagena. Café Stepping Stone – best budget café. I stopped by Café Stepping Stone for a quick brunch and loved its cute hipster ambiance and amazing food. 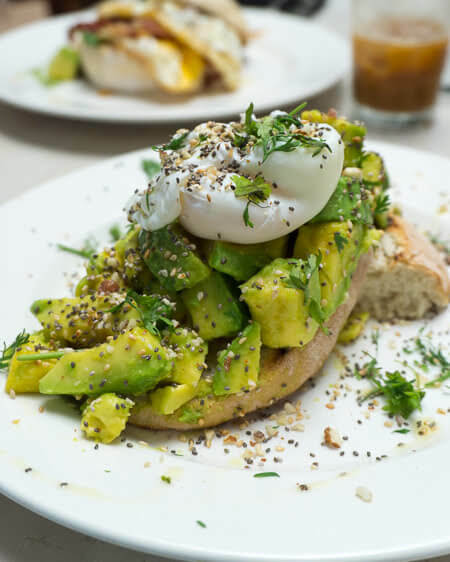 The avocado toast topped off with a poached egg is a must! Cebiches & Seviches – top rated Peruvian seafood restaurant in Cartagena. With glowing reviews on both Tripadvisor and Google, this ceviche spot is one of the best stops in Cartagena for a quick bite and a cocktail after a long day of exploring Old Town. El Arsenal: The Rum Box – best spot for drinks. As the owner says, everything at El Arsenal comes sprinkled with love and he means it. From the moment customers enter this gastropub, they are greeted with hugs and friendly service. From incredible drinks to a welcoming atmosphere, you are guaranteed a good time at El Arsenal. 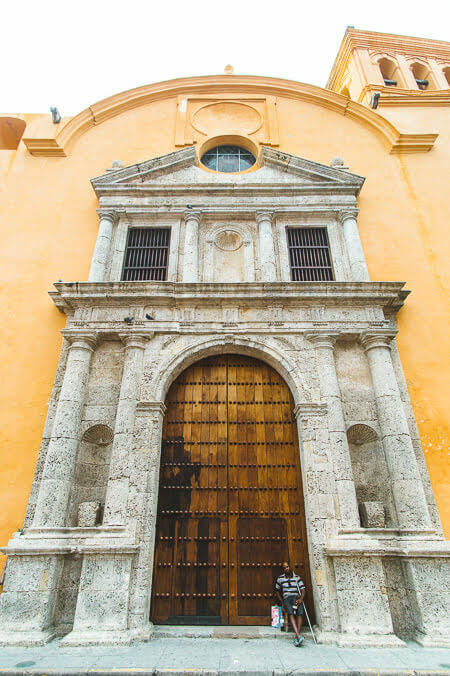 Iglesia De San Pedro Claver is a 16th-century church located in the midst of Old Town, Cartagena. With beautiful façade built from stone, this historic church is grand in architecture and looks. The Iglesia De San Pedro Claver church is still used for mass every day and offers guided tours that cover the history and inception of the church. The plaza in front of the church is used to show off some really cool street art. 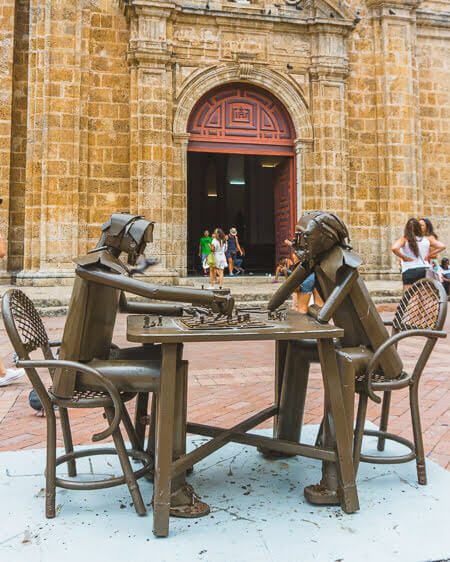 The plaza has a few caricature-like tin statues showcasing local Colombians doing everyday things like playing chess. Colombia has a few well-known coffee regions growing and selling some of the best coffee in the world. Currently, there are two major coffee trends clashing and competing in Colombia – older companies mass producing coffee and selling it to big grocery stores and a newer hipster movement growing more flavorful coffee sold in boutique coffee shops around the world. One of the coolest coffee shops in Cartagena is the Abacus Books And Coffee, a cute coffee shop that also serves as a bookstore. Know for its eclectic decorations and unique ambiance, Abacus Books and Coffe is a cozy spot to grab a coffee, a book (or WiFi) and relax in Old Town Cartagena. Iglesia de Santo Domingo is the oldest church in Cartagena. This church has a simple yet elegant exterior paired with an ornate interior. The inside of the church has a high ceiling with massive columns and arches with a huge altar in the center of it. The picturesque interior of the Iglesia De Santo Domingo church makes it a highly popular place for weddings and religious ceremonies. 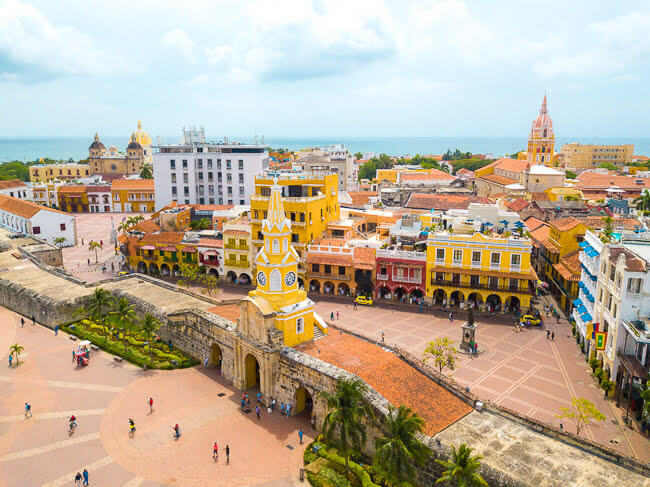 The Gold Musem is the perfect quick stop in the Walled City to take a break from Cartagena’s heat in an air-conditioned museum while marveling at a collection of intricate Colombian gold relics. The exhibit itself is quite small and takes only 30 minutes to an hour to see the entire collection. It covers a bit of Colombia’s history and the origins of these gold relics. And the best part… it’s completely free! While Old Town and Getsemani are the most popular areas to explore in Cartagena, Manga has a charming feel of its own. 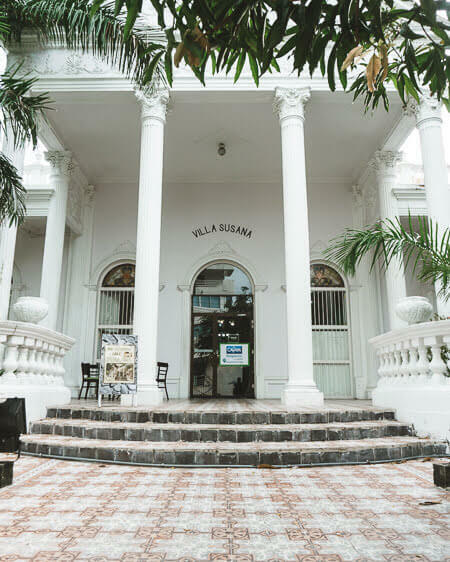 Located just 10-minute walk outside of the Walled City, Manga is a quiet Colombian neighborhood filled with beautiful Colonial and Republican style mansions. Some of these mansions are now used as government buildings and one mansion even houses the local police. During my week-long stay in Cartagena, I rented an Airbnb room in Manga. The prices for Airbnb rentals are much cheaper in Manga than in Old Town or Getsemani by half. A beautiful shoreline path leads from Manga into Walled City so I didn’t mind the 10-minute walk to get to Old Town whenever I felt like exploring Cartagena by foot. Ready for a fun trip to Cartagena? Check out these top rated hotels in Cartagena for the perfect Carribean vacation in this beautiful Colombian city. Have you been to Cartagena? Let us know your favorite things to see and do in Cartagena in the comments below! If you’re looking for other amazing places to visit in Colombia, my next stop after exploring Cartagena was heading out to the El Cocuy National Park in Colombia’s Sierra Nevada mountains for a week of incredible hiking and camping. For more on my time at El Cocuy National Park, check out my post here.